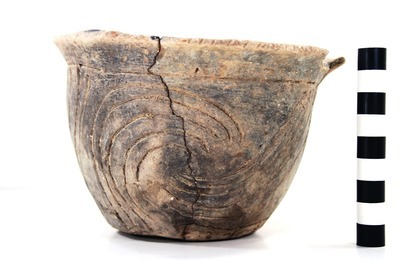 "41HS261, 2003.08.705, Burial 8, Vessel 28" by Timothy K. Perttula and Robert Z. Selden Jr.
DECORATION (INCLUDING MOTIF AND ELEMENTS WHEN APPARENT): The lip is notched, and the body has three repeating arcs (four lines each) of trailed lines that end in hooked arm elements. Keno Trailed bowl, Burial 8, Vessel No. 28, J. O. and Henry Brown site.